This is my first contribution for the Arduino community. With this library you will be able to play wav or ad4 files easily. Will be adding new method or features in the future. Built this cause I need it for my Arduino project. Unzip Wtv020sd16p.zip and copy Its content into the Arduino library IDE folder. If you have any question or request, please don't hesitate in contact me. Added pause, stop, mute and unmute method as well updated the example program. Hope this helps. 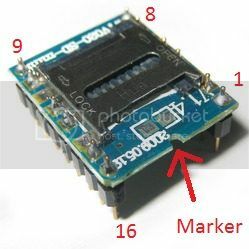 I am going to play with the same module but decided to ask and get the pin diagram confirmed. I found the following application circuit for this device. I believe the following is the way of identifying the pins. Can you please confirm? Updated the library. You can read about changes in post # one. Bravo, Tested library and worked fine..
And answering my previous question, I tested this with a 2GB SanDisk MicroSD card successfully. In other words there is no limitation of 1GB. Weird, I tested a 2gb genuine Kingston and did not work. 2gb for ad4 files is a waste of space anyway. Yes. That's true. But here in my country it is really difficult to find a Micro SD with a capacity less than 2GB. My Prototype didn't work with 1GB Unbranded micro SD card. But in the case of this audio module we have no way to check where the error is. If it is simply in SD card, then you may lose hours for troubleshooting. But as far as I see, the sd cards that fail on this module cannot be read using SdFat or Arduino SD library. 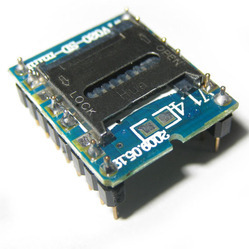 In summary if you can read an SD card using SD library then it should work on this audio module as well. Where can I order this thing? What is the difference between them? Will this library work for both? and I do believe this library will work with both. I bought one of these on ebay, trying to use as sound module for portal gun replica. I wired up as data sheet suggests, connected to my arduino lilypad, and tested. No sound from piezo speaker, busy led flash 2 or 3 times then full on constantly. I'am using a Sandisk 1gb micro-SD, has anyone tested one of these to see if they work? 1. Did you convert your files to AD4 format? 2. Is the naming convention of the files correct? 2. Do you know your SD card is "supported"? I am successful in using a SanDisk 2GB so I believe your sandisk 1Gb should work without any trouble. The best way to verify this is to use a SD shield or Ethernet shield just to verify your MicroSD. 1: Yes the files were converted. Just to make sure I downloaded the test file made (and tested) by another user on these forums. 2: As far as I am aware, I just needed to copy the files named 0000.ad4, 0001.ad4, etc to the SDcard root dir? 3: Ok. If the file tree is correct, then I will try a different card. I don't have a shield to test it with, as money is tight at the moment, and I've never needed one. Please let me know about the file tree if you can, as I can't find any info about it on the web. Cheers! I've been working on the WTV020-SD-MINI for about 1 week but to no avail. After reading up almost everything posted on the web and utilizing all the files that were shared which proved to be working, I'm still not getting any sound except a few bleeps when the busy pin's LED blinks. I'm currently using a 1GB Samsung uSD card and I think that it is the culprit. Will get back to you guys soon after changing the uSD.